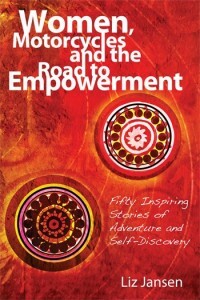 Women, Motorcycles and the Road to Empowerment explores the relationship between women, motorcycling and personal power. Fifty women motorcyclists share stories of how they have tapped into that power and how it has shaped their lives. Using her own story as a framework, the wisdom of forty-nine other women join Jansen in a common message of inspiration. They represent all disciplines of riding and come from diverse backgrounds; including one of Hollywood’s top stuntwomen, federal politicians, artists, activists, adventurers, business leaders, racers, a dental hygienist. While the motorcycle is the vehicle of transformation for these women, it’s not necessary to be a rider to understand the book’s message. How one learns to embrace and overcome challenges and reap the rewards, weaves an exquisite tapestry that becomes the picture of who we are.